Sunday 19th May sees a flurry of swapping, chatting and networking as Lambeth swap squash and bean seedlings. There are events at no less than FIVE hubs around the borough: Bandstand Beds on Clapham Common, Brockwell Park Community Greenhouses, Growing Rosendale in Herne Hill/East Dulwich, Ruskin Park Community Garden and Streatham Common Community Garden. Phew! Don’t worry if you miss this Sunday, you’ll see more events on 2nd and 9th June. Come and see us at Bandstand Beds for the Big Lunch picnic, 11 – 2 on 9th June. Come along, all are welcome. 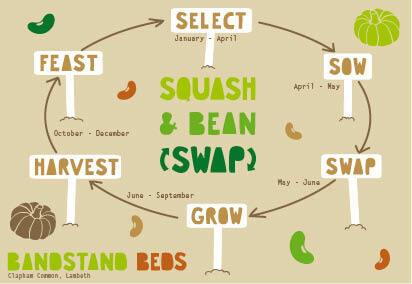 If you’ve grown extra from one of our sowing events, please bring and swap! Otherwise there will be extras to give away and growing advice.